Elfin carrot tops, micro mustard and radish sprouts emerge from an Amagansett greenhouse. AMAGANSETT —Delicate and lovely and doomed from birth to an early death, microgreens—bright-flavored shoots of herbs and leaves—are the neurasthenics of the salad world. Until recently no one grew them in any quantity on the South Fork (although Satur Farms in Cutchogue offers them, as does Koppert Cress, which counts the New York Yankees among its high-profile clientele). From time to time you might spot them at a certain fancy food shop, but those microgreens always look travel-spent, all but fainting away. 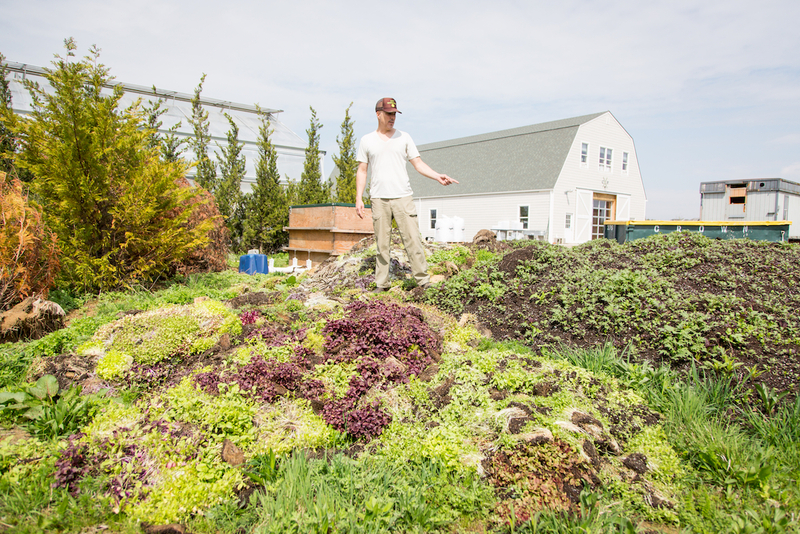 And then last June, small packets of fresh microgreens started cropping up at Provisions in Sag Harbor. Through the summer and into the fall they continued to materialize, but from where? And he should know, because Davison (shown opposite page) happens to be a practitioner of shamanic energy medicine. During his apprenticeship, he spent time in Cuzco, Peru, where, it appears, shaman-farmers are not unusual. Reflecting on the close connection between the two callings, he realized his was to devote himself to microgreens. The idea turned out to be a good one. When he went round to restaurants like Nobu, South Edison, Sen, and Nick and Toni’s with his first harvest, the chefs all wanted to know when he could bring more (12 to 18 days from seed to plate, depending on the variety). This past summer, customers included Ruschmeyer’s, Navy Beach and Crow’s Nest in Montauk, as well as the 1770 House in East Hampton and Estia’s Little Kitchen in Sag Harbor. Having outgrown his backyard quarters due to demand, Davison plans to move the year-round business to an 1,800-square-foot warehouse in East Hampton and extend his reach to restaurants in Brooklyn and Manhattan. What’s more, most of the big growers rely on soil-free growing mediums, while Davison uses an organic potting mix enriched with worm castings, bat guano and fish meal. And then there’s that metaphysical ingredient he’s slightly embarrassed to talk about. Laurel Berger is an arts writer in Sag Harbor. Good Water Farms sprouts and microgreens are sold at Provisions Natural Foods in Sag Harbor, Naturally Good Foods in Montauk, and the Sag Harbor Winter Farmers Market. goodwaterfarms.com.